It will soon be eight years since I was installed in this Cathedral as the eleventh diocesan bishop. 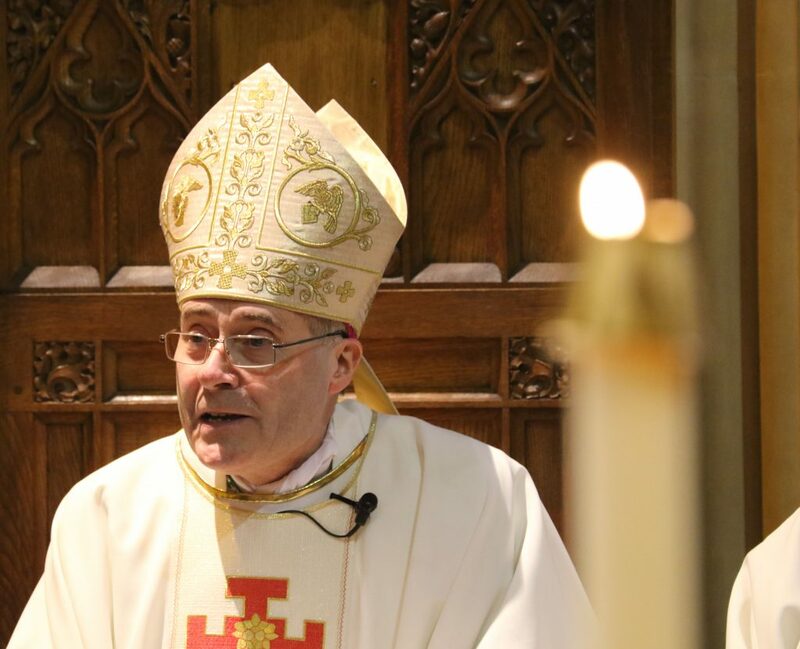 I quickly noticed how the bishop’s chair is designed to be too big for the occupant reminding us how this office is bigger than the passing individual; and is made strangely uncomfortable perhaps to remind each bishop that in this place there can be no repose! I do sometimes wonder what my distant predecessors saw from this same place in Shrewsbury Cathedral. The word ‘bishop’ means ‘over-seer,’ who must maintain a view even wider than the geography which extends from the Shropshire hills to the Pennines. For in every generation, the bishop is called to hold onto the true vision which unfolds for us in the Scriptures tonight. As Saint Luke poignantly notes, “all eyes in the synagogue were fixed on him” (Lk. 4:21). Yes, from the desperate, first beginnings of this Diocese; through the immense challenges of Industrial Revolution; of global wars and confronted by a series of destructive ideologies, we have been called to keep our eyes firmly fixed upon the same Jesus who is truly, “the Alpha and Omega … (the One) who is, who was and is to come, the Almighty” (Apoc. 1: 8) In Him alone are the promises of the Scriptures fulfilled “even as we listen,” (Lk. 4: 21) so even the blind are given new sight (Cf. Lk. 4:18). Tonight we pray together for such sight, to recognise the One who comes to us now in the mystery and reality of the Eucharist which was first entrusted to those who receive the anointing of priestly ordination. I ask you to pray for your priests tonight that we will be more united with the Lord Jesus, more closely conformed to Him and never more so than when we stand at the Altar (Cf. 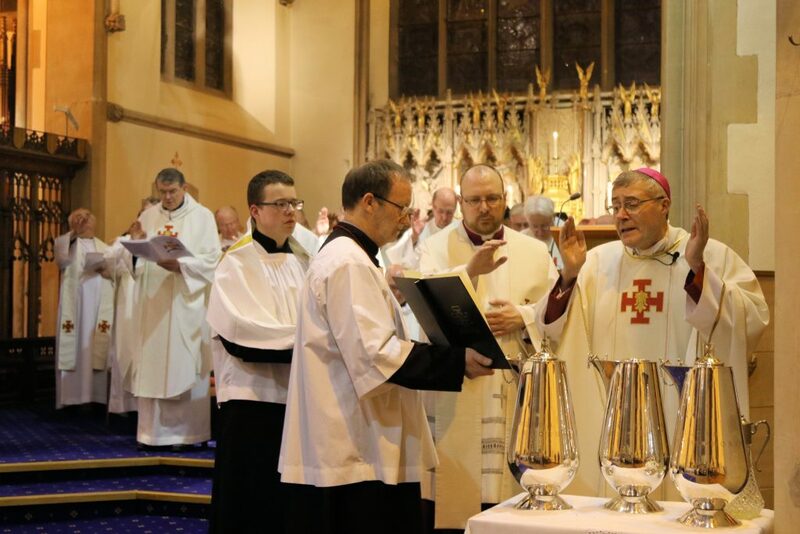 Renewal of Priestly Promises). Today, I would be unable to read the text of the prayers without the aid of glasses to focus and clarify my vision. In an infinitely greater way, we must pray for the grace never to approach the Altar blind to the Gift placed into our hands; the Sacrifice renewed, the Blessed Sacrament which shows a love which truly goes to the end (Jn. 13: 1). Let us pray that this vision may never fail. Our Cathedral embodies in stone this vision of faith. In a centenary year marking the end of the Great War, we will dedicate a new chapel here to Saint Michael. In so doing, we will acknowledge how it is the hidden, spiritual battles which underlie all of human history and give an honoured place to the Memorial of those men of Shrewsbury who, like so many across the world did not return home. At the dawn of the 20th Century, Pope Saint Pius X saw clearly the gathering clouds of war; for six years, he spoke explicitly of the conflict to come and the grave trials of the century ahead. At the same time he took the extraordinary initiative of recalling the whole Church to that vision which never fails. Saint Pius X pointed humanity to the Holy Eucharist in which we can all glimpse the greatness of our calling. Nine years before the Great War, the Pope astonished many by his urgent insistence that the faithful should receive frequent Holy Communion – meaning weekly or even daily – and that the children should now receive their First Holy Communion from the earliest possible age. No liturgical change of the 20th Century was greater or more significant than this one. It wasn’t that this far-seeing Pope wished for greater laxity or a more casual attitude to receiving Holy Communion or simply to restore an ancient practice. No, Saint Pius X saw that in our time there could be no mediocrity: Christians would either strive to become saints or cease to be Christian at all. Sadly, this is a perspective which can be lacking when frequent Holy Communion is spoken of today: the radical call to holiness inherent in receiving the Body and Blood of Christ and the very means of reaching that goal, of becoming the saint God calls us to be. In the middle of 20th Century, the Second Vatican Council would take up once again Saint Pius X’s call urging all of the faithful to ‘frequent’ (a beautiful word!) the Sacraments of Penance and the Eucharist in their striving for the fullness of the Christian life and the perfection of charity – in short the goal of holiness. In the days of the Paschal Triduum about to begin, may we all keep our eyes fixed on Jesus truly present with us now in this Great Sacrament. And in this Year of the Eucharist, may nothing obscure this clear vision of faith. For this, let us ask Our Lady’s help in those beautiful words of Dante’s hymn: “Lady, lest our vision striving heavenward fail, still let thy petition with thy Son prevail.” So may we never lose sight of Him! Amen.